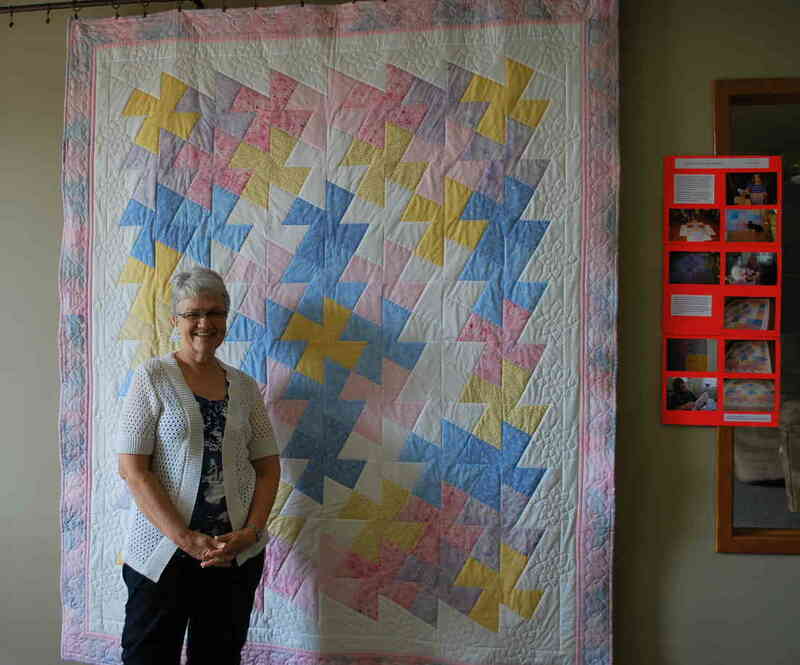 It’s a Mennonite church, and quilts are just part of that. Hopefully this page will be an ever growing series of quilts associated with our church. 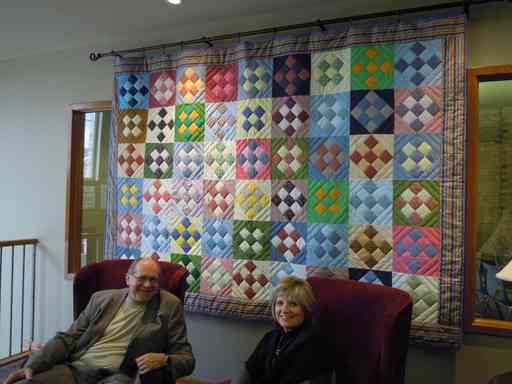 (admittedly, it would be better if more of the stories behind the quilts were here too. Hopefully those who remember will contact the website committee to let us know some of them.) 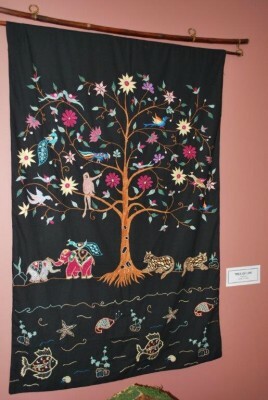 Where we have them, the stories are included following the quilt image. Waterloo – If you walk by the library at Conrad Grebel University College around lunchtime, you might spot a few people sitting around a large, incomplete quilt with needles and thread in hand. 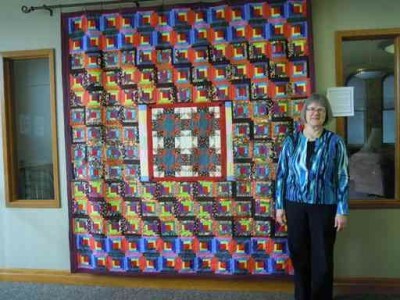 A library might seem like a unusual place for quilting, but this particular quilt is truly a grassroots community project – students, staff and faculty work on it during lunch and study breaks. Quilting is traditionally a communal craft, so it is a fitting project for the Mennonite college that is affiliated with the University of Waterloo. It’s a long process that is put into action when the fall semester begins. 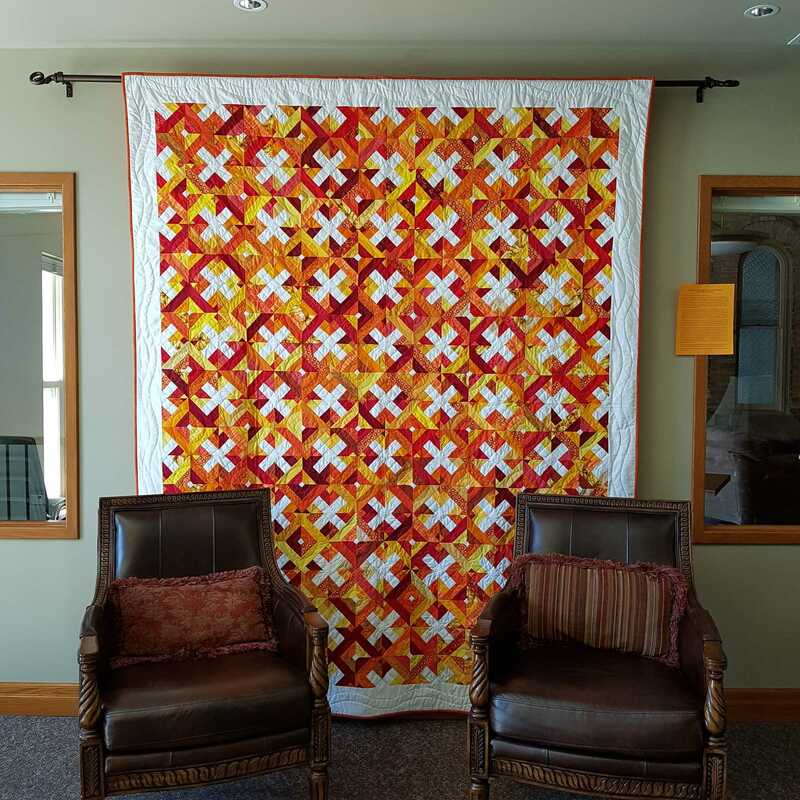 Project organizers put out an open call to the college community to donate fabric in shades of yellow, red and orange for this year’s quilt. “We picked a pattern that was easily accessible to non-quilters that would also be interesting to a quilter,” Macfie said. The donated fabric was cut into strips in the busy atrium so students passing from the residential and academic sections of the college building could stop in to help out. “It’s amazing how many people we had come by who had no experience with quilting,” Macfie said. 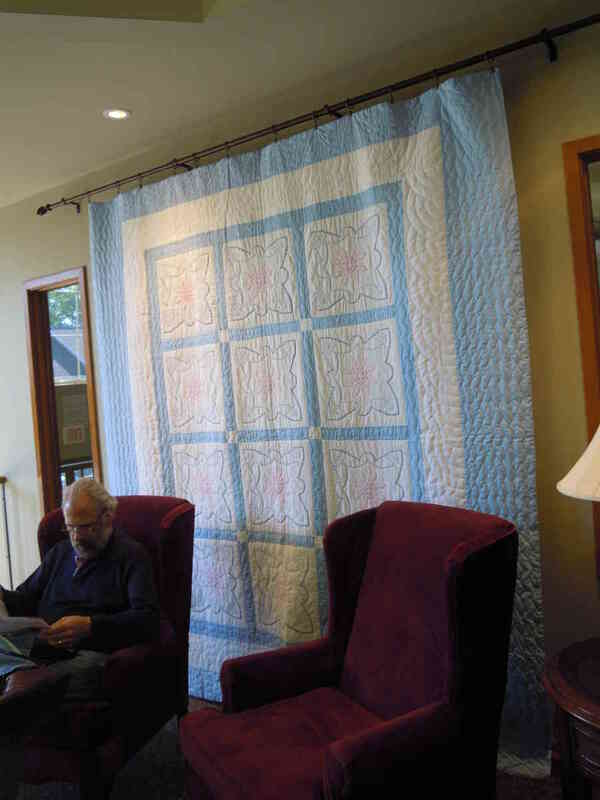 Once it was time to start sewing, the quilt was placed in the library so anyone could pop by to put in a few stitches whenever they have a bit of time during the day. 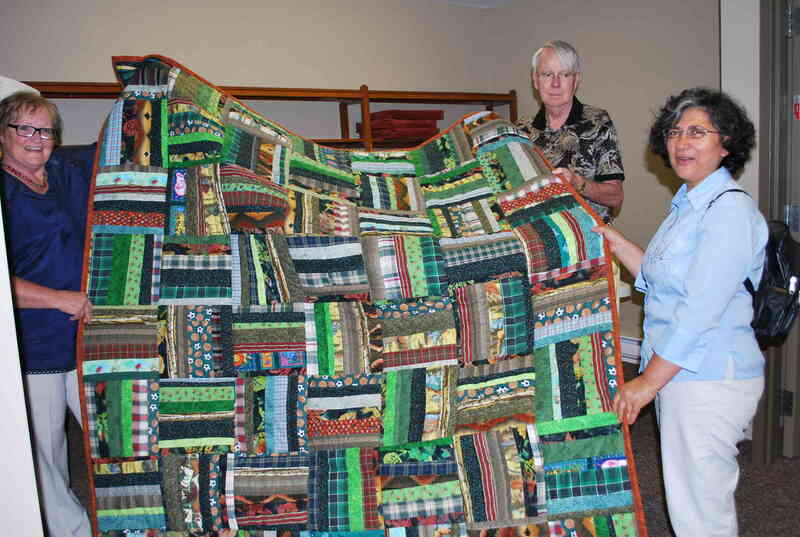 “It is really nice to sit around the quilt, put in a few stitches and have a bit of conversation,” Macfie said. 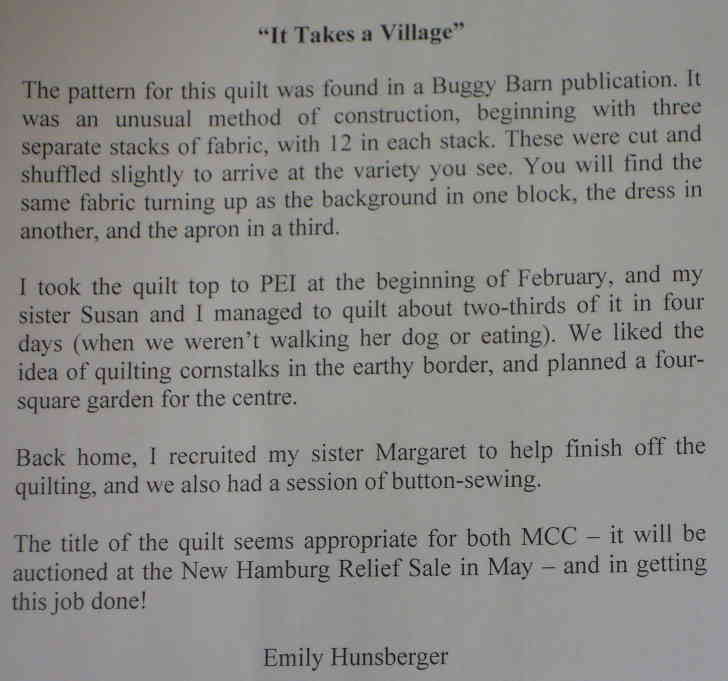 “I work in the library so I get to see how everyone pitches in to work together.” The community quilt, a sunny pattern of simple symmetrical shapes will be donated to the New Hamburg Mennonite Relief Sale, held in May. 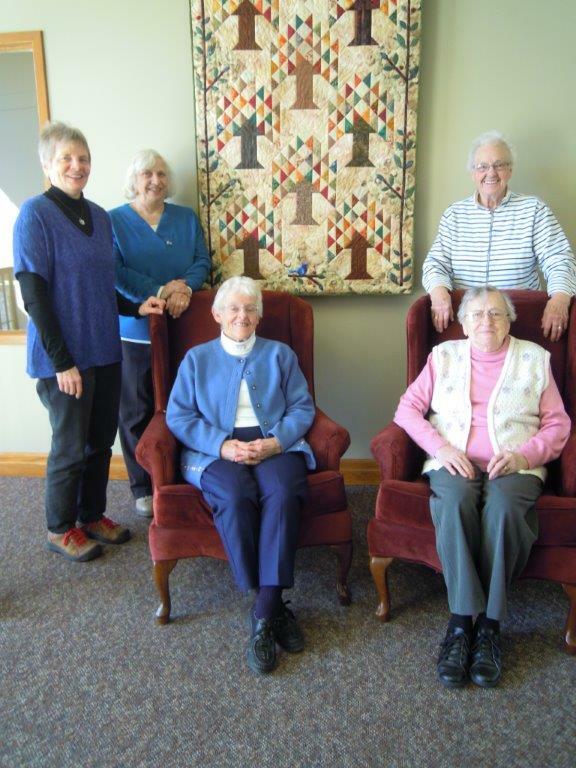 A photo with the article showed sewers Pam Bartel, Mandy Macfie, Sara Cressman, Grace Friesen, and Ben Martin working on a quilt. 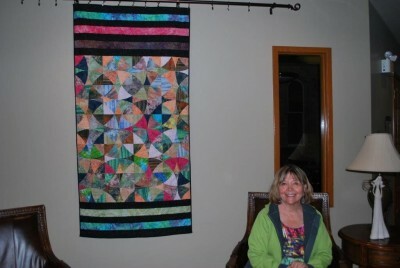 Carol Lichti helped quilt too. 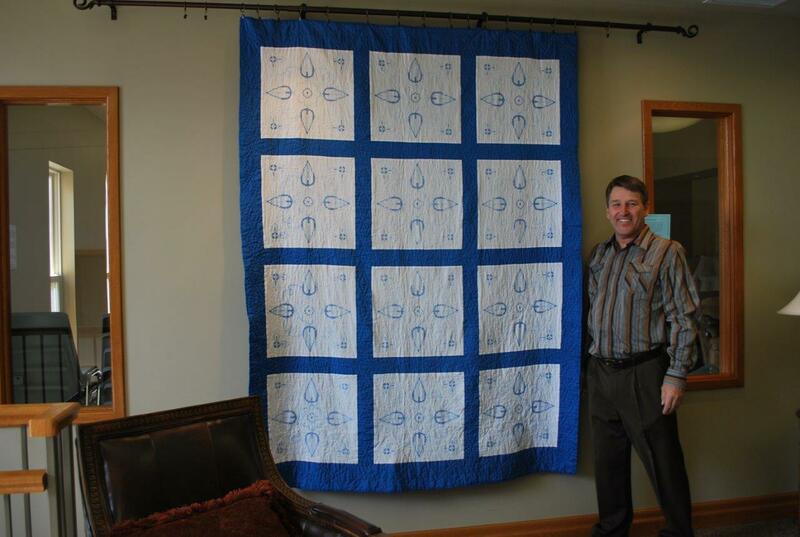 Thanks to Mandy Macfie and Judy Pearce for making it possible to hang the quilt at Erb Street! January was a month of stripping for me! That is to say, sewing up my collection of fabric slivers. It took perseverance to trim all those fabric strips into widths ranging from 1” to 2 ½.” Each width was sewn randomly end to end to make very long ribbons, which were cut 60” long. 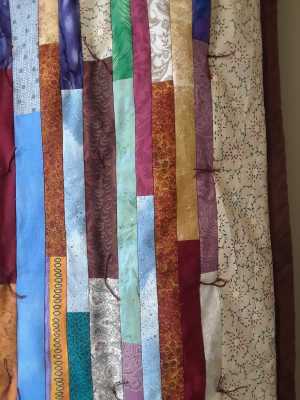 The cut strips were randomized, for width, placement of seams and colours, then sewn side by side. Borders added, and voilà! Two large twin bed comforters for myself, this one for MCC, and enough stripped blocks for another couple of MCC comforters. And before you ask – NO, I do not want or need anyone else’s scraps! I only feel responsible for my own. 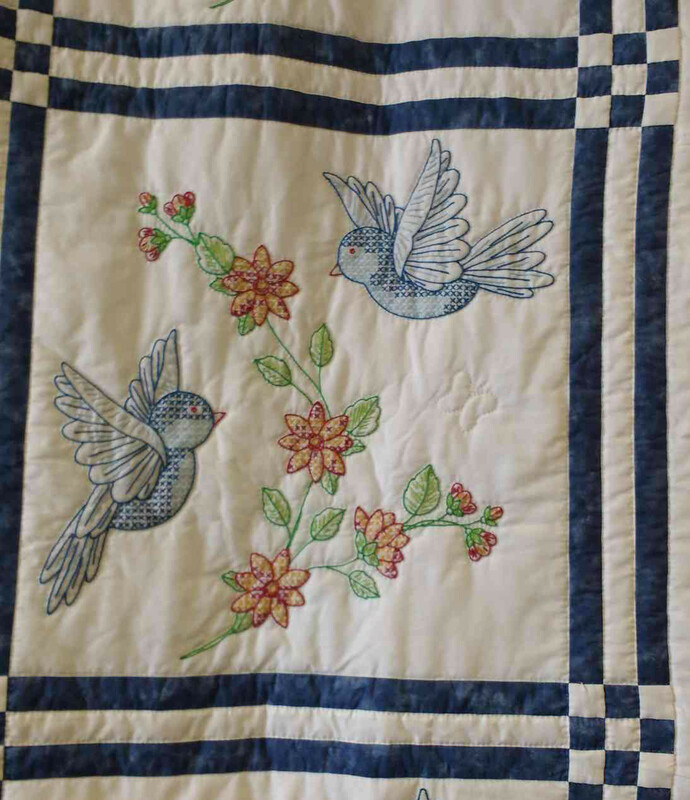 This quilt was on my bed at my parents’ house when we cleaned it out. 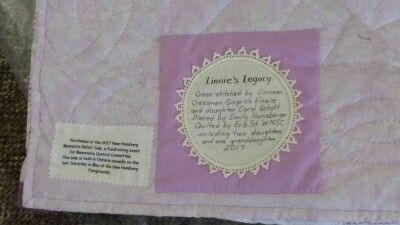 Not all of the squares have been “signed” but they were all hand embroidered. I think it must have been a quilt that my mom and others made in preparation for her wedding. It’s dated 1950 and my mom and dad got married on July 18, 1950. 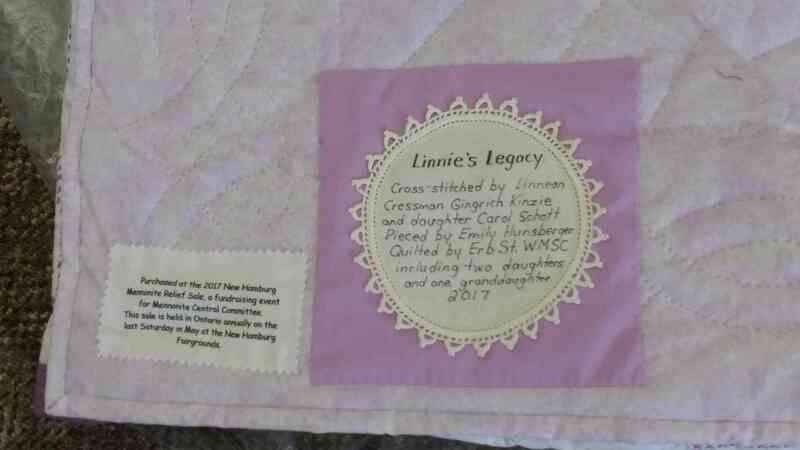 She embroidered her patch with her maiden name, Loretta Steinman. 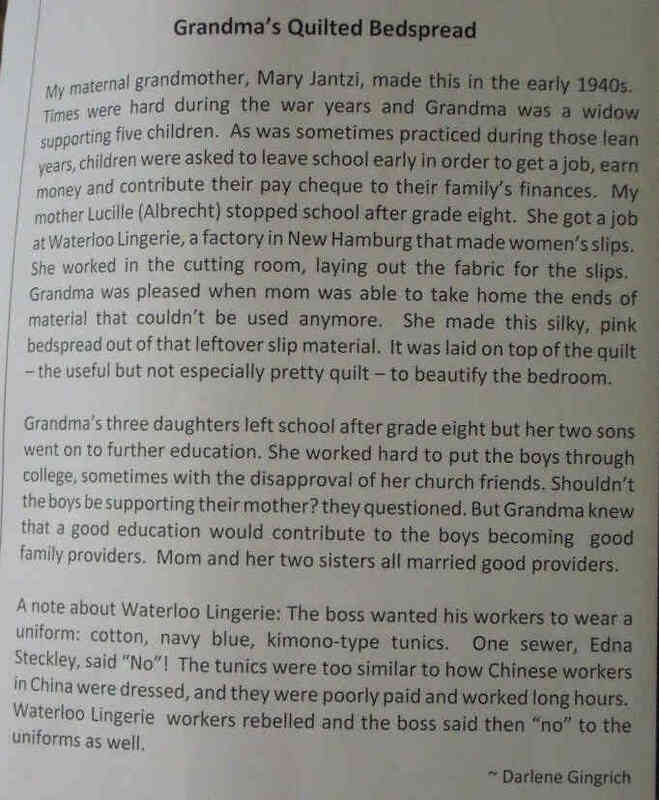 My great aunt Barbara Steinman never married and never really had a job. She used to help relatives when they had babies. I remember her coming to “live” with us while my mom was in the hospital with my little sister, and she stayed for a while after. Like many Mennonites of that time, she refused to accept any money from the government. Her only real way of earning a living was to make quilts for others. 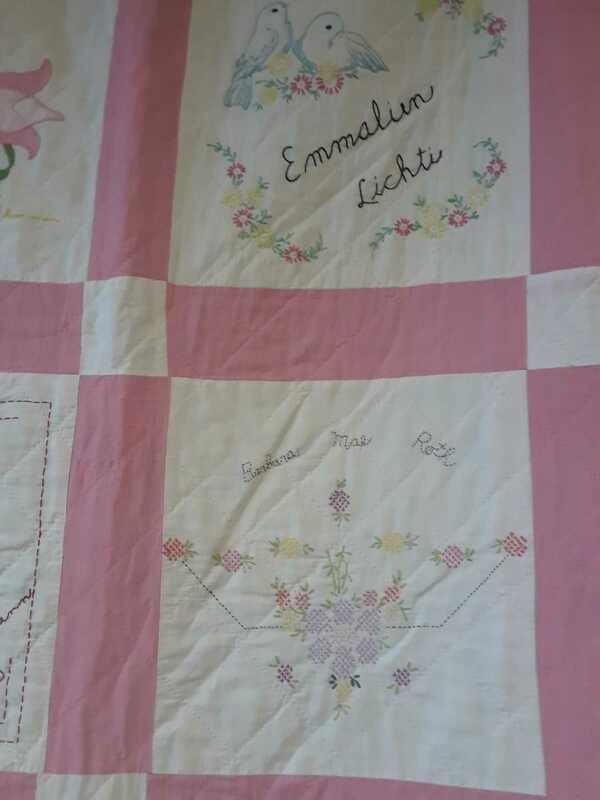 She was a favourite great aunt of mine and so when I saw her name and my mother’s name on the quilt I just had to keep it. The quilt blocks are signed as follows from top left to right. Most of these people have passed away. I’ve noted if they are still alive. Emma – I’m assuming this is my Aunt Emma who married my uncle Mahlon Steinman. They lived in the Tavistock area. Ada Steinman – An aunt who married my uncle Alvin Steinman. They had the farm right across from Steinman Mennonite Church. Emmalien Lichti – An aunt married to my uncle Elmon. This is Ruth Jantzi’s mom. She is 95 and still alive, living at Nithview. Reta – this is my mom’s cousin Reta Bender. She lives in Baden. My mom was very close to her. Barbara Mae Roth – married Nelson Zehr, a cousin of my father. Nelson and Barb are still alive and have been good friends of my parents. Erla Jantzi – She married Leonard Frey. I don’t know her though. Alice (Wagler) – A longtime neighbour and close friend. Alice is still alive. Mrs. Vernon Roth – This is Ruby Roth, a step-daughter to my great aunt, Druscilla Jutzi (Druscilla is Nelson Zehr’s mother.) Again, interesting that she used her husband’s name. Mrs. Mervin Bender – My aunt Leona, my father’s only sister and only surviving sibling. She is 98 years old and lives at Nithview. Hilda Jutzi – She is Ruby Roth’s sister, married to Elmer Wagler. I believe they are both still alive and live in New Hamburg. Mrs. Stanley E. Helmuth – I think her name was Irene and that they moved to the US. Almeda Gingerich 1950 – She married Eldon Wagler and they lived on a farm outside of New Hamburg. Some of the quilt blocks are really intricate. My great aunt Barb’s has the tiniest stitches I’ve ever seen. Her name uses different colours of thread. While many blocks have flowers, my mom’s block has two little bluebirds – the bluebird of happiness? Lovebirds? Sheer speculation on my part. But it’s fascinating to take a look at some of the images and try to figure out why each was chosen. 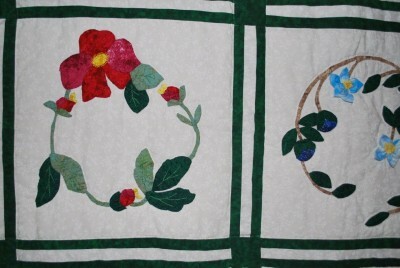 Enthusiastic and fast-learning grades 3 to 5 kids knotted this comforter on two Sunday mornings. 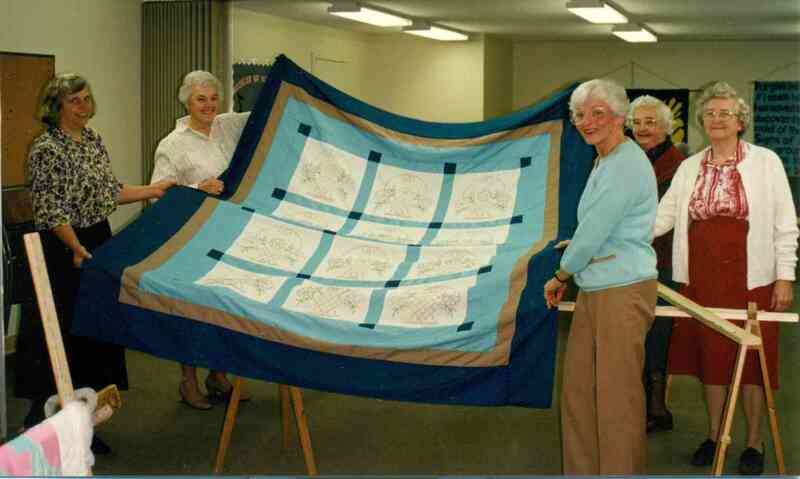 It all started because the Sunday school curriculum mentioned quilts and Glenda brought one in and talked about it. The kids made paper blocks for a quilt, then Glenda suggested it might be fun if they knotted a comforter. 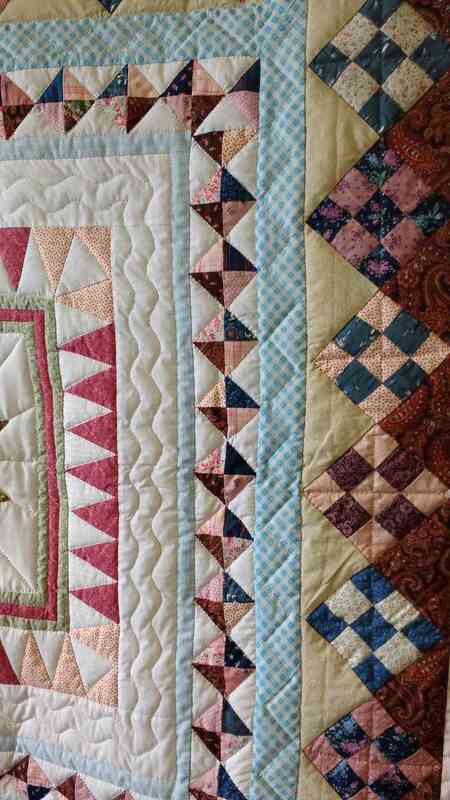 (They look much like quilts but are held together with strategically placed knots instead of an overall design of stitches.) 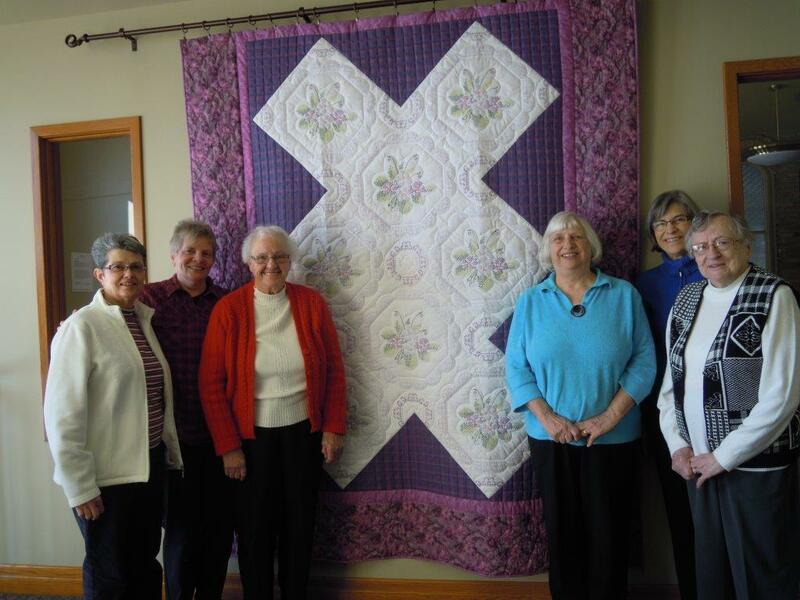 Erb Street church has a long tradition of making quilts and knotting comforters and donating them to MCC. Ardith Frey and Gladys Brubacher have been sewing comforters from “kits” that Emily Hunsberger put together. Two of them used these many small colourful squares that have been in the sewing room for a long time, waiting for the perfect project. Glenda recruited Knotter Professor Kathy Lichti to give instructions. Kids and adults who helped were Uwera and Agape, Bettina, James, James, David, Jack and Lena; Glenda Ribey-Rozmiak, Kathy Lichti, Jo-Anne Matthies, , Mike Leepoy, Sharalynn and Michaela Krahn. 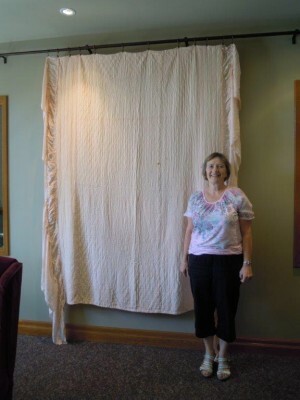 When the knotting was finished, Lucille Weber finished the comforter by binding the edges. 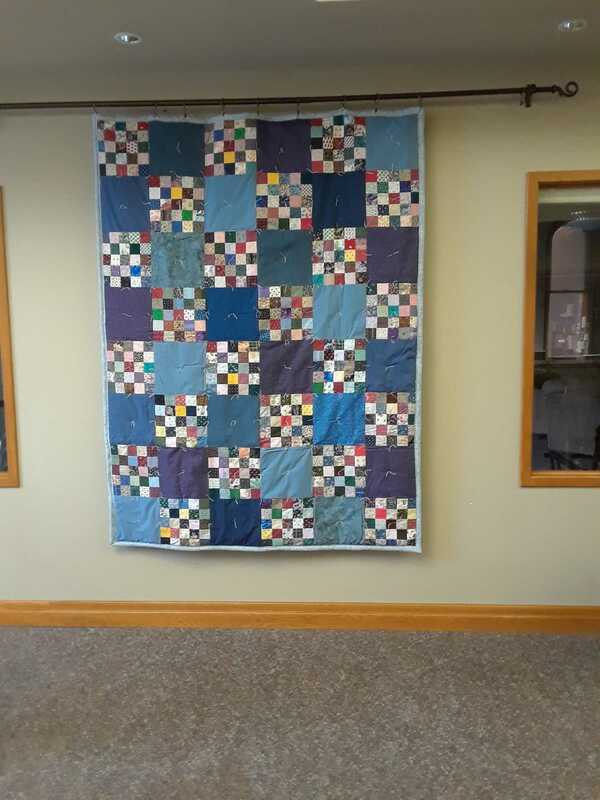 Glenda and Marion Roes hung it in the foyer so everyone could see it before it goes to Mennonite Central Committee to be given to someone who needs a blanket. My husband, Ron Flaming, has collected many neck ties over the years. Last December when Ron retired from House of Friendship he brought the ties home that he stored in his office. These ties in addition to the ones he already had at home increased the collection of ties significantly. Periodically I brainstormed about what to do with all these ties. 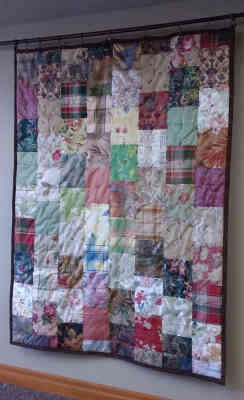 This fall I came up with the idea to make a quilt. Through conversations with people and searches on the web, I developed my own ideas and they slowly evolved as I cut and sewed. 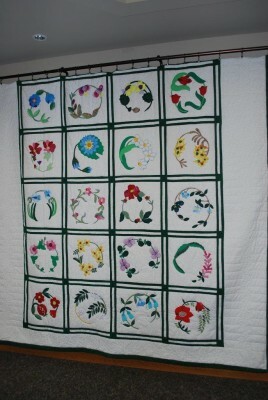 The quilt morphed in to a table runner as I decided that a quilt was too large a project. The table runners are made from recycled materials except for the Christmas print on the border of two of them and some interfacing that was used to stabilize the fabrics. I found flat sheets at the Thrift store for the borders and backing. Not sure what I will do with them. But they were fun in the making. If anyone is inspired by these creations and has other ideas of how to recycle neck ties, I would welcome them since I have not noticeably decreased the inventory of ties at our house! For many years, we have sent our kids up to Silver Lake Mennonite Camp. (Yes, even BEFORE Dave Erb was the director!) Starting sometime after 2008, the campers would be given their own T-shirt to bring home with them after camp ended. We collected quite a few each year, a different colour and often with different designs. I decided to make a blanket with them since the kids had grown out of many of them. This is the result. I gave it to Miranda when she became a staff member and it was quite the hit with the other staff who also remembered wearing a lot of the same shirts. For anyone who quilts, you might know that T-shirt material is, well quite frankly, annoying to work with. It stretches out of shape unless sewn against something stiff. These were backed with an iron-on interface to keep it stiff, but I could only find plastic so as a blanket on a bed, it’s a little hot. It does make a nice picnic blanket though. Since the age of six I have played soccer with several groups of girls who have grown up with me and shared my same passion for soccer. 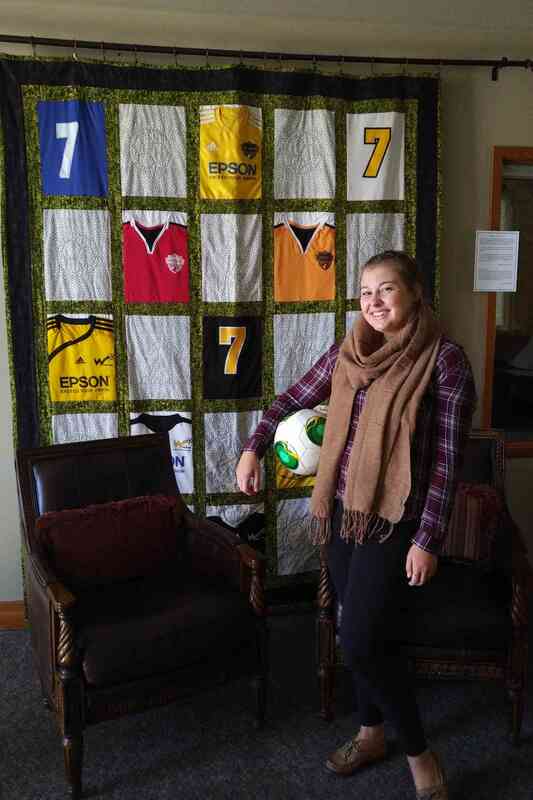 These girls became my soccer family, and year after year I saved the jerseys to remember our victories and losses. I wanted to do something to remember my time with this sport and commemorate these teams which brought me many great memories. 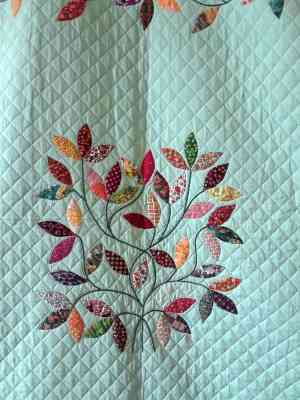 Our work on this quilt was not always simple. I had more than a few mishaps with measurements, but by the end everything was fixed up. 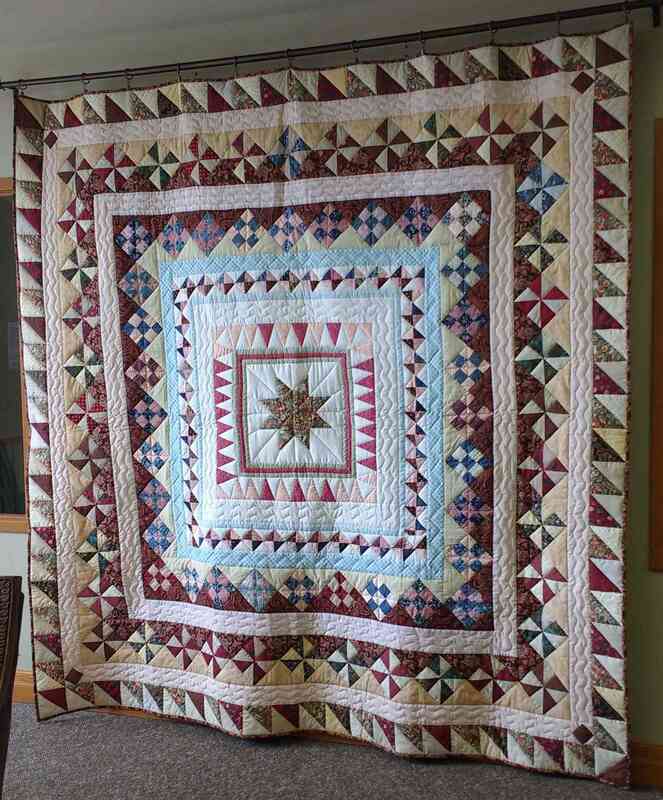 My Grannie-Annie Wallace and I spent a couple of years putting this quilt together and I am more than pleased to share our hard work with you! This quilt was made by my maternal grandmother, Valina Martin (mother of Erma Shantz) who was a lifelong member of Erb Street. 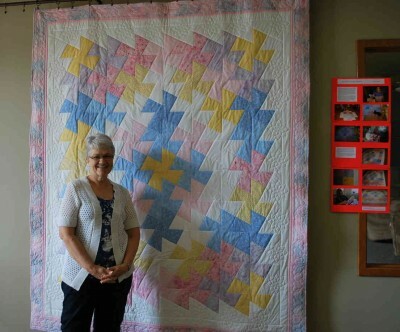 She made quilts for her 13 grandchildren and gave them to us in an interesting way. 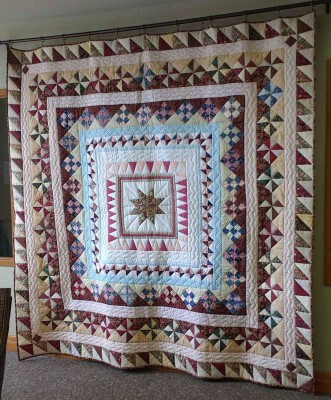 The Christmas before she died, she had all of the quilts attractively displayed in a large room at the home of George and Vera Weber (also daughter of Valina). 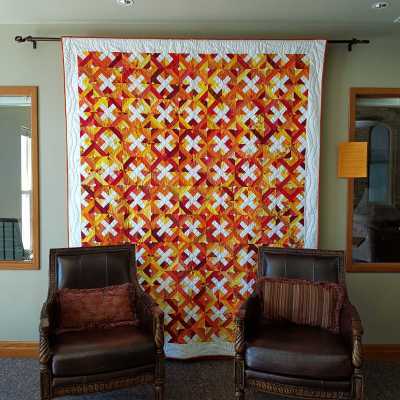 Each quilt had a number attached to it that we could not see. In a bowl, were numbers on paper she had cut up for us to draw. From eldest to youngest, we proceeded, one at a time, to pick our number and thus our quilt. We had the option of trading after everyone had made his / her selection, but as I recall, we all kept our original one. 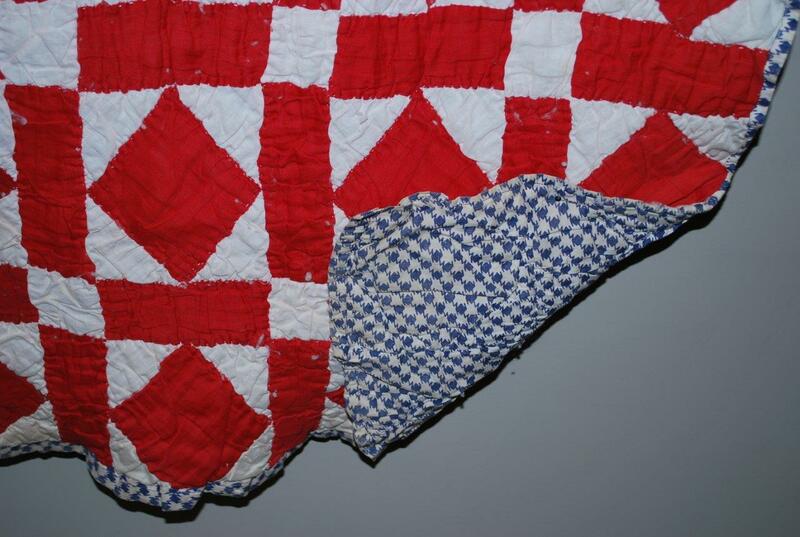 This is the quilt that was my “pick from the hat.” John and I used it on our bed for at least the first ten years of our marriage, then I thought it should be preserved. OK, we just found the photo again, so why not. 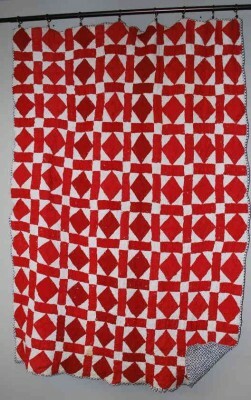 Marion Roes embroidered the squares. 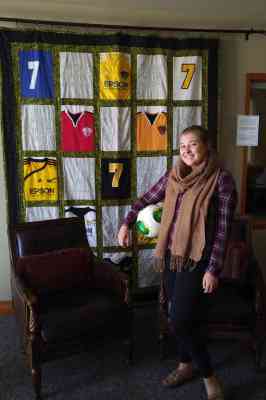 Emily Hunsberger designed it and the Erb Street women quilted it. It was donated to the Relief Sale that year. 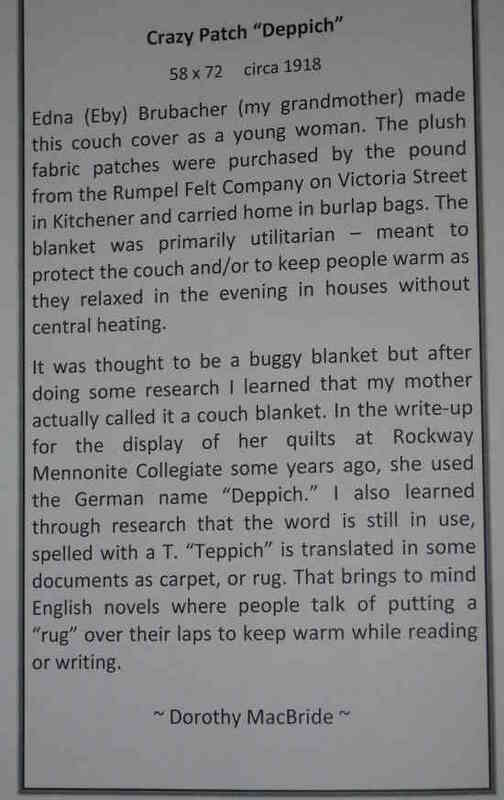 Our WMCEC / Sewing Circle (Women of Mennonite Church Eastern Canada) often gets anonymous “surprises” put into our sewing closet as donations. Last month there was a bag of drapery-type samples which someone had already started to join into rows. 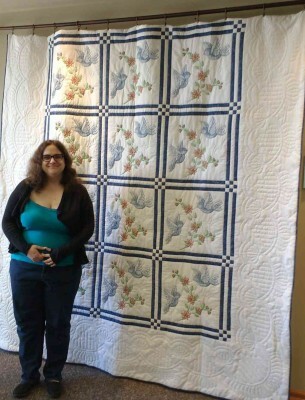 Emily Hunsberger added a few more pieces to make a big enough comforter for MCC, and backed it with brown flannelette. We would like to say thank you. Will the donor of the material please come forward?! (update) One of the donors has come forward! But we still have a bit of a mystery. It’s not known or remembered who brought the samples years ago. Ruth J picked them up, started sewing the squares together, brought them back… and eventually we had a lovely warm comforter to donate. Thanks to everyone! 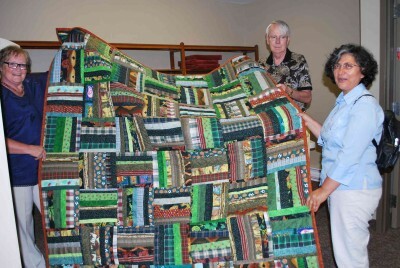 The six leftover blocks were incorporated into a comforter that was sent to Haiti last year with other donations from Erb Street. rheumatoid arthritis for as long as Albert could remember. 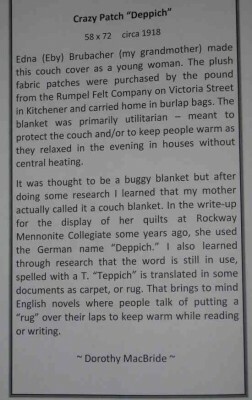 Did she indeed do the quilting? 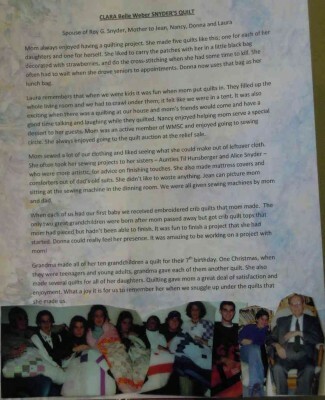 Apparently she could knit for short periods of time and she made bandages for the Cancer Society, so who knows? Maybe she was able to sew for a bit. The quilt is fairly small and maybe older than first thought. It could have been used on a smaller bed for Salome who was born in 1900. 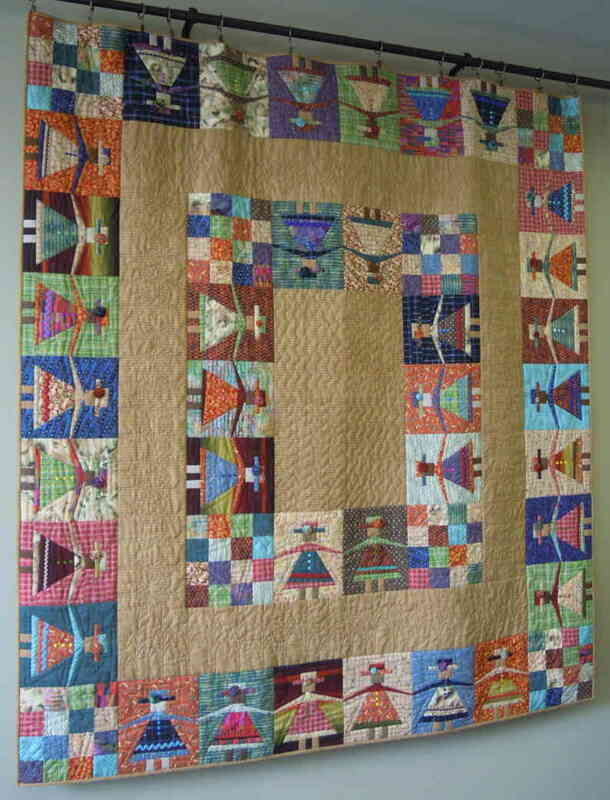 Made as a sample for a class taught at Len’s Mill Store, Waterloo, Ontario, November, 1999. Note: All Christmas materials. The embroidery on this quilt was done by my maternal grandmother Carol Martin, and was quilted by someone else. 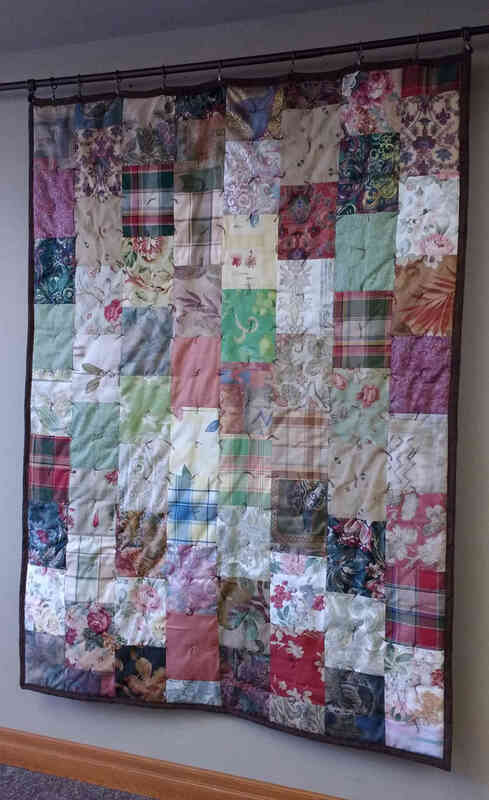 When I was younger Grandma decided that she would make a quilt for both of her granddaughters (I am the younger), for their 21st birthday. She decided on birds because I had loved them as a child. Grandma started working on it a few years before I was 21 and I have some very clear memories of watching her work on it when I was visiting. She would work on it anywhere – at hoe, at the trailer – and I have been told she took parts of it on a trip to Africa. In 2009 Grandma was on a mission trip in Africa when she became ill. She came back to Canada and it was discovered that she had lymphoma. It progressed quickly and not long after she returned home, she passed away. 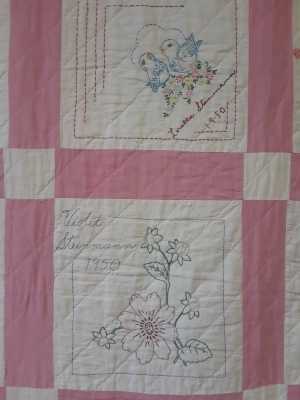 I had turned 21 just before she passed and the quilt had been finished. Although she wasn’t able to give it to me herself, I have always cherished it, a beautiful final gift from an incredible woman who I loved very much. When it became clear that my grandmother was not going to get better my mother told me that if I ever missed her, all I would have to do was wrap myself in the quilt and it would be like she was giving me a hug. So says the label on this quilt. And that is the short story. The longer story is a little more interesting. 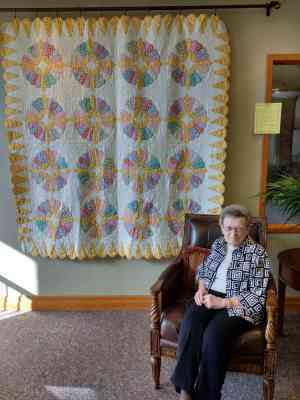 Nora Bechtel spent her retirement years piecing quilt tops – many, many quilt tops. 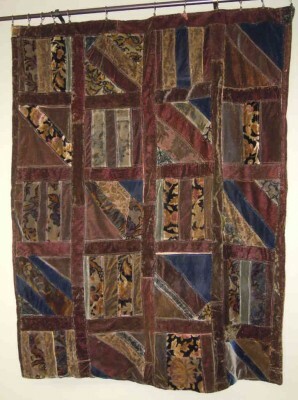 When she died in 2009, there were still dozens that had not yet been quilted. Some of those went to Muriel Bechtel, Nora’s daughter-in-law. 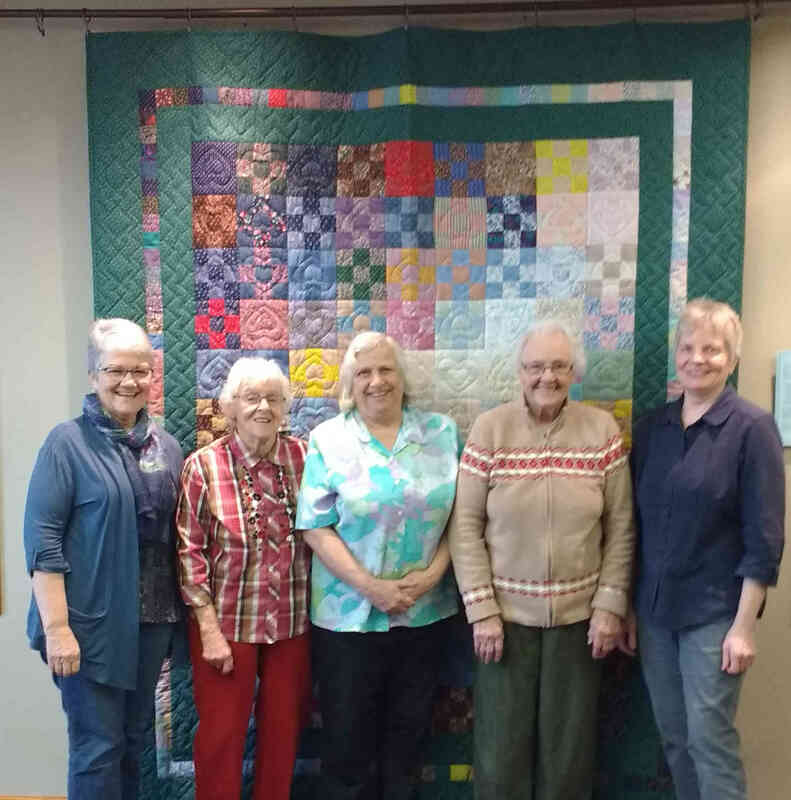 When Muriel and her husband Dave were downsizing, Muriel gave some of the tops to her friend, Ardith Frey, who brought them to Erb Street to be quilted and donated to wherever they were needed. 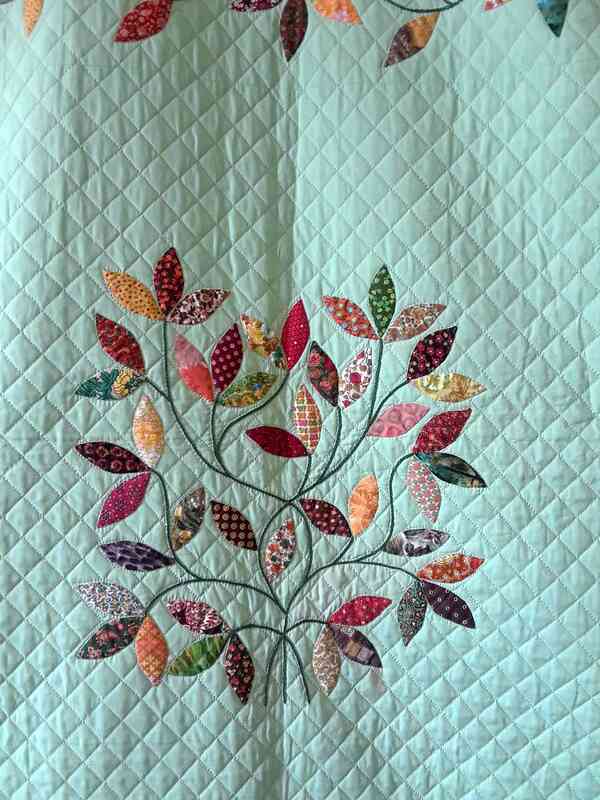 This quilt is one of those tops. The request was made that this quilt be given to Gordon if he indeed does move into the building when it is completed. 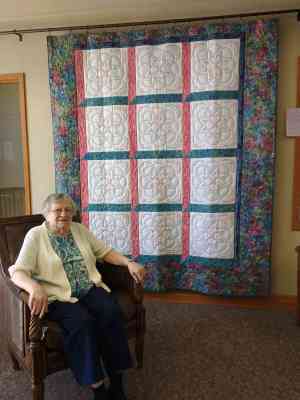 Nora would be pleased to know that her nephew Gordon was the recipient of one of her quilts. 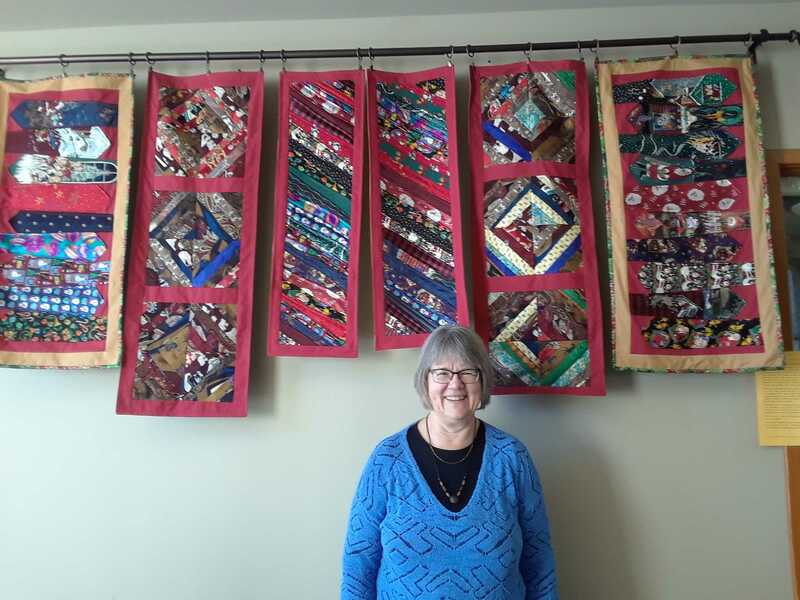 Kathy Bauman’s idea for the first MennoHomes project on Village Road is now a tradition… that is, to present a quilt or knotted comforter to a family when they become a tenant of MennoHomes. Members of Erb Street’s WMCEC answered a request for quilts and comforters for the new housing project in Elmira. The top was pieced by Carolyn Sumsion, a friend of Emily Hunsberger. The building in Elmira is located at the corner of Church Street and Memorial Avenue on land purchased in partnership with Woolwich Community Services (WCS) in 2014. 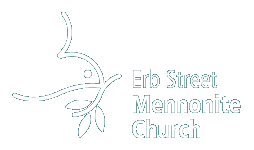 MennoHomes coordinated the installation of site work and services with WCS to reduce costs and minimize disruption. 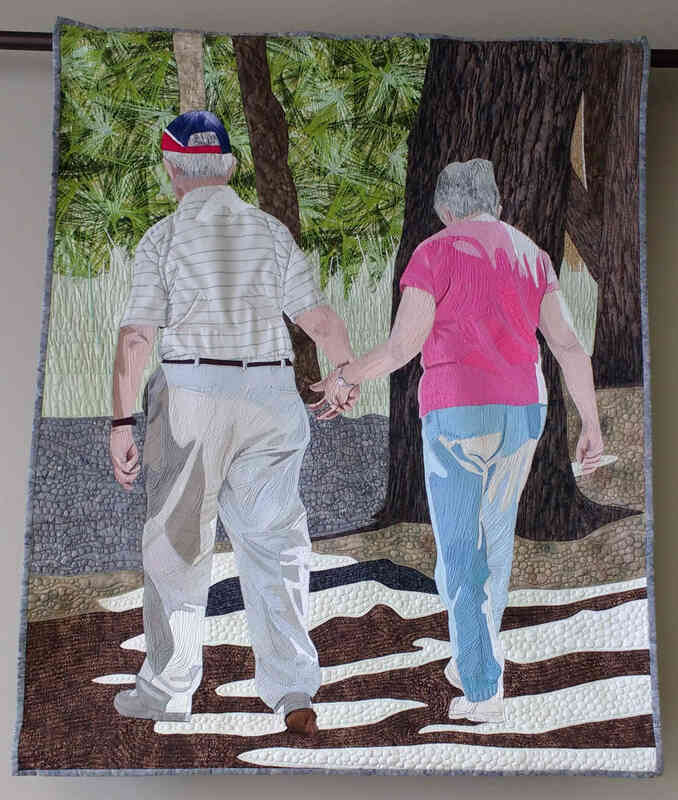 This quilt was inspired by a beautiful photo I took of my parents, in January 2014, at Myakka River State Park in Florida. I love the holding of hands and the supporting of one another as they manoeuvred over uneven ground. This is indicative of their almost 64 years together. They have faced many joys and sorrows. They have travelled the world. They have resided in many places. no matter where they have been or what they have faced, it has been hand in hand, supporting one another with dignity, love and devotion. I am so grateful I still have them and am still able to enjoy their company. I love you Mom and Dad!! I loving memory of Cliff. He passed away on Dec 4, 2016 at the age of 89. 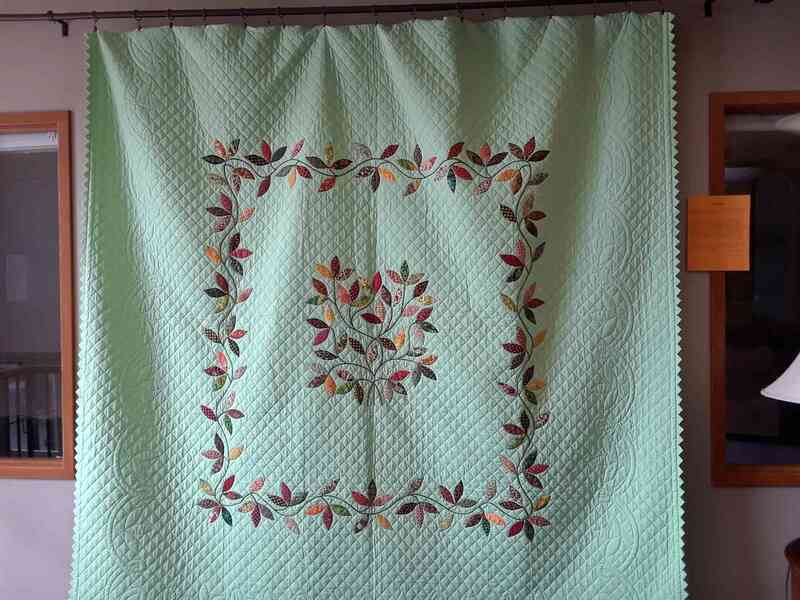 This quilt was completely hand=stitched by my Great Aunt, Frances Ramer. It and several of the heirloom quilts from the Ramer family have red as the predominant colour. Frances was the daughter of Elizabeth Nighswander and Daniel Ramer and the family lived in the Markham, Ontario area. Frances was the middle child, having an older brother, Enos, and a younger brother, Martin who was my grandfather. Sadly, Frances died from diphtheria at the age of 13 because it was unknown at that time what caused the disease or how it was spread. A funeral service was not held for her. Her father Daniel Ramer, wrapped her body, placed it in his horse-drawn wagon and drover to the Wideman Mennonite Church cemetery. Near a stand of pine trees on the west side of the cemetery, he along dug her grave and buried his only daughter. His wife Elizabeth died two years later. 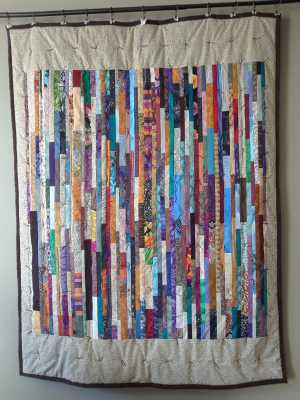 The patter for this quilt is a design of Harebrained Happenings in Scarborough. 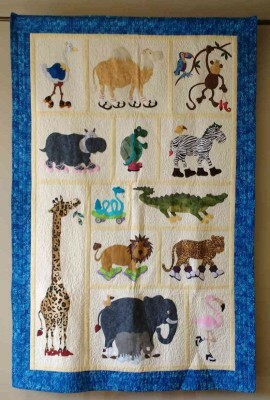 (www.harebrainedhappenings.com) The original inspiration was for a comfort quilt for cancer patients and survivors; however, its whimsical design can bring a smile to anyone of any age who may be facing the challenges of some other horrible disease, thus the pattern is aptly named “Jungle Walk for a Cause”. When I first saw the pattern I knew it was one I would like to tackle, although it would be my first attempt at applique, and machine quilting a project of this size. Attaching the shoes to the animals was fun and made me smile at the silliness especially the thought of a hippo wearing ballet slippers, and giraffe in high heels or the camel in socks and sandals. 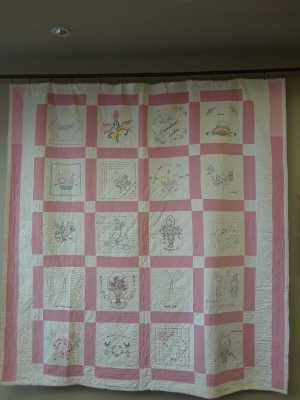 Working on this quilt was therapeutic as well as fun. Five years ago I suffered a stroke and am thankful for a full recovery and fell so blessed that I am still able to fulfill my passion for sewing and share this gift with others. God Bless. Margaret Gerber, Stratford. Mennonite Central Committee aids many people around the world by way of a myriad of programs and resources that aim to relieve the desperate circumstances and help build communities. Canning meat is one of the many ways people can help relieve and rebuild. During the last week of April, 600 volunteers came together to help can 58,500 pounds of chicken. Not only do we need the physical help, but $130,000 is needed to buy and process the meat. 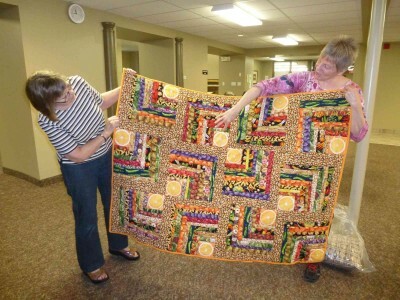 For the sixth year in a row, volunteers donated and quilted this quilt during canning week to raise funds for the meat canning project. 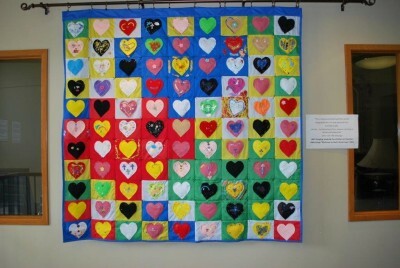 Many loving hands made this quilt possible. All funds from the sale of the quilt are used to help can chicken. 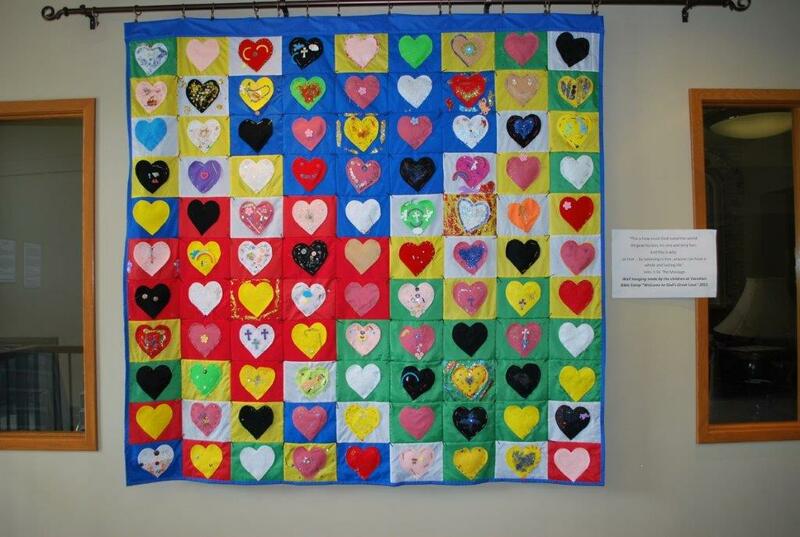 Approximately 30 volunteers helped to quilt this beautiful quilt in 2 days! 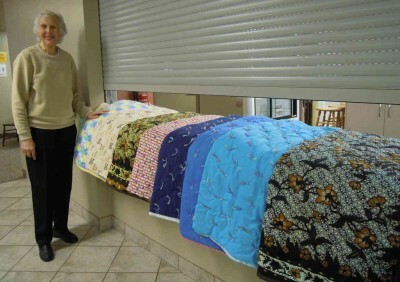 Many more helped knot comforters during this period as well. 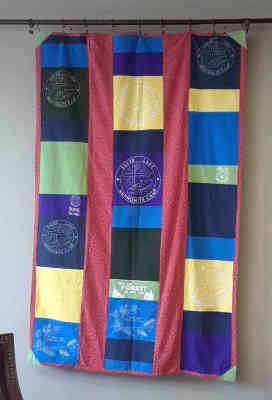 These comforters are also sent by MCC around the world. Don and I noticed this quilt on display for silent auction at the Stl Jacobs Mennonite Church on Tuesday May 24, the first day of its “Quilts for the World Display”. We decided to place a bid “for a good cause”, assuming more bids would follow. Four days later we had a phone message telling us we had bought a quilt! We were and are suprised, but thrilled! “This is how much God loved the world: He gave his Son, his one and only Son. What shapes do you see? 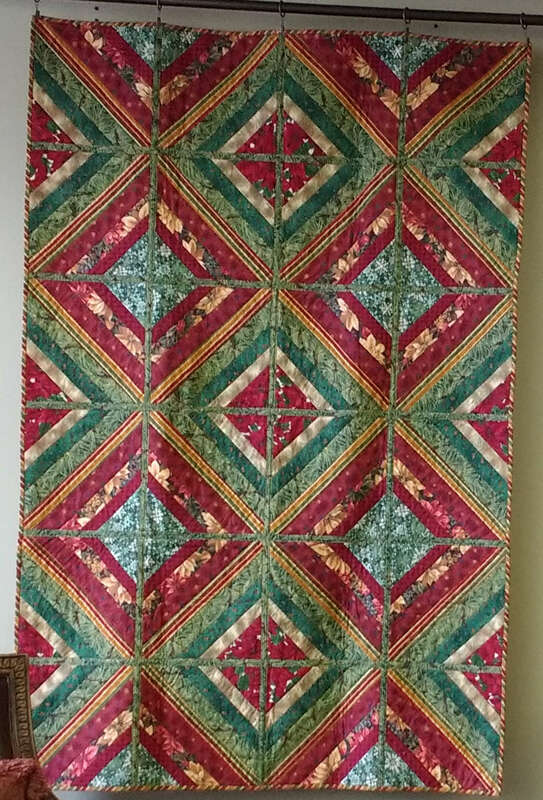 This is my second attempt at quilting and my first attempt at curved piecing. I like standing back and looking at it for a while because the longer I stare, the more different shapes I see. One winter in the late 1970s, I was working in construction and laid off. Sue’s father, who was working with CN railroad in Kitchener at the time, offered me a swing-shift job controlled the signals at the King Street track crossing near Victoria Street. My job was to manually turn the light and gates on and off when trains were crossing. There were many many trains, so the shifts were long and boring I needed something to do to keep me awake! 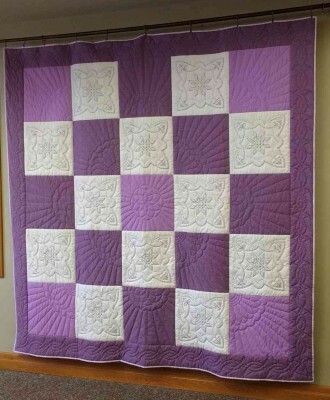 I am not sure why I would have thought of doing quilt blocks, but my mom often made quilts when I was young, and my father was doing some cross-stitching at the time, so I thought why not? 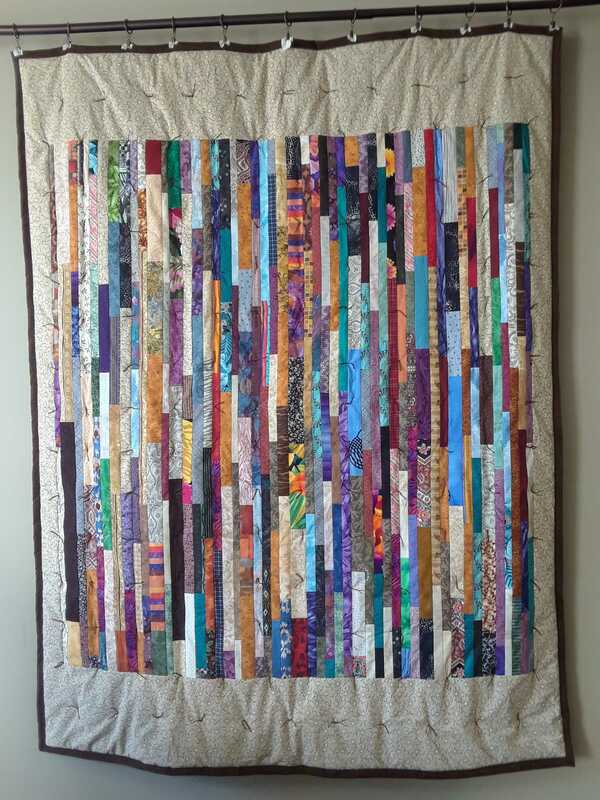 I cross-stitched the blocks over a number of months and never really gave any thought to getting them made into a quilt. Remember the goal was to keep me awake during long boring shift hours. A friend of my mom sewed the blocks together and the quilting group at First Mennonite Church where we were attending agreed to do the quilting. Since the quilt was so basic, we used it on our son Nathan’s bed for years so it is showing the wear and tear…. Frankly, I am surprised that Sue kept it. I have always marvelled at the beauty and mystery of flowers. 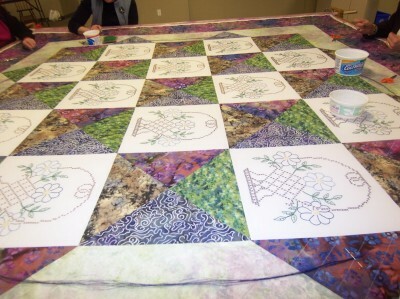 In March 2015 when I saw these patterns in the online book “Flowers of the Bible”, I knew that I had to download them and work on transferring these beautiful wall hanging design/patterns into a quilt which I wanted to donate to the 2016 Relief Sale. It took me the full year to complete my quest. 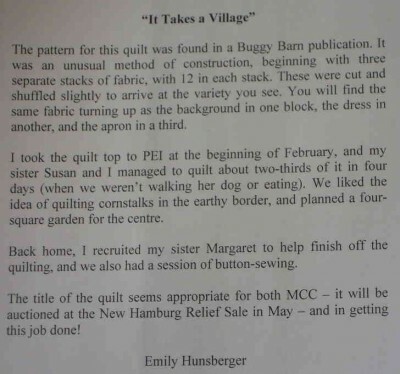 I was also intrigued by the research which Helga Curtis provided in the book for each of the quilts. She provide the KJV biblical reference as well as fascinating facts related to each flower. 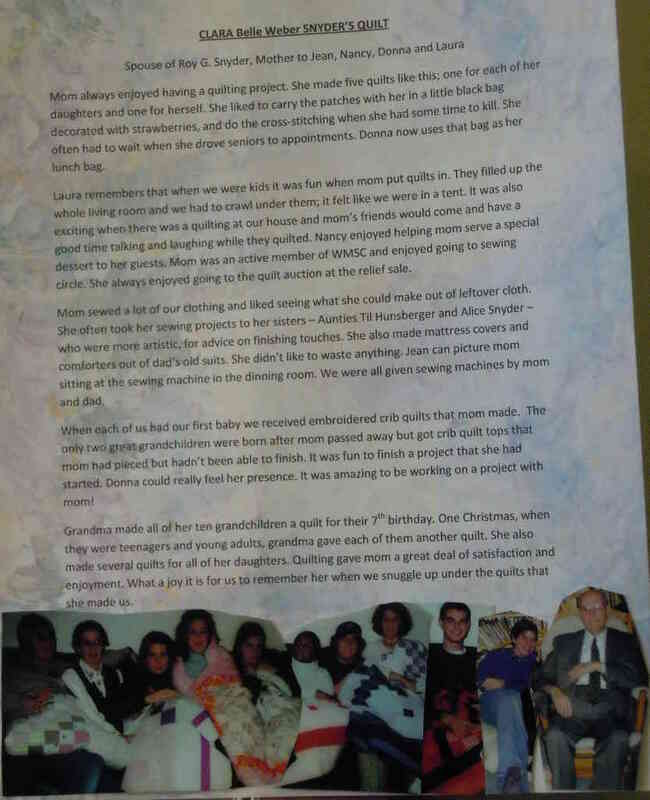 I determined that upon completing the quilt, I wanted to include some of the information that she shared as well as additional research in booklet form which I would include in the quilt. Norm assisted me in collating the research for the booklet. 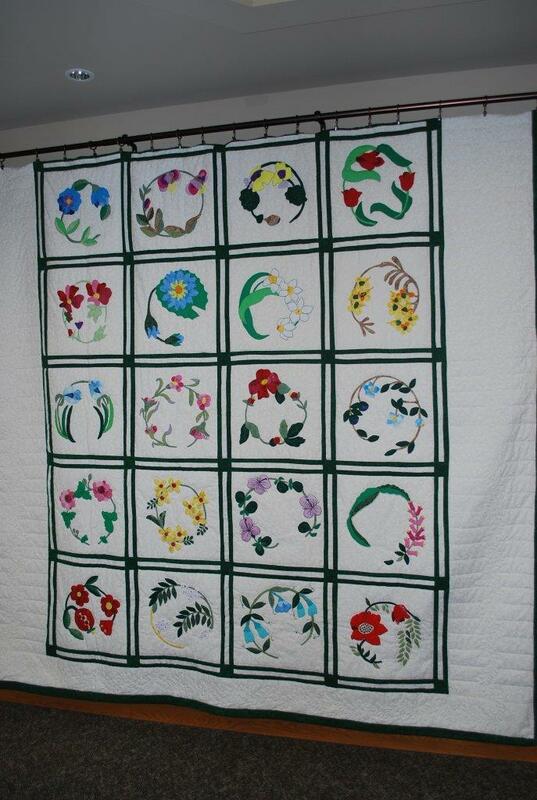 It was a job for me to work with and discover the beauty of each of these flower designs and I hope that this quilt will provide a better awareness of God’s masterpieces as well as a better understanding of the context for each of the flowers. and the story behind the preceding quilt. Many years ago, I cross-stitched these squares and more, about 16 in total. This is the third quilt made with them. 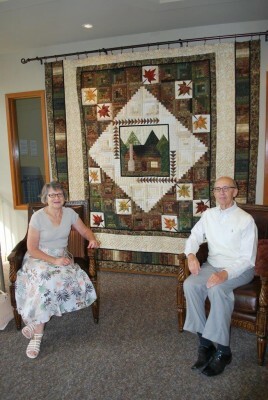 One was quilted by the Erb Street quilters and donated to the New Hamburg Mennonite ReliefSale. 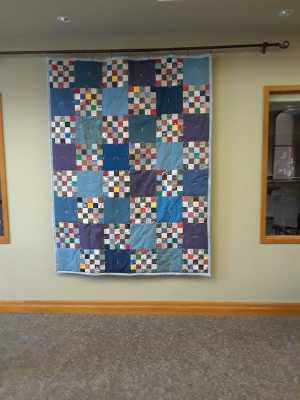 This one was going to be donated there too, but when I saw what Emily Hunsberger had done with the squares, I wanted it for myself. 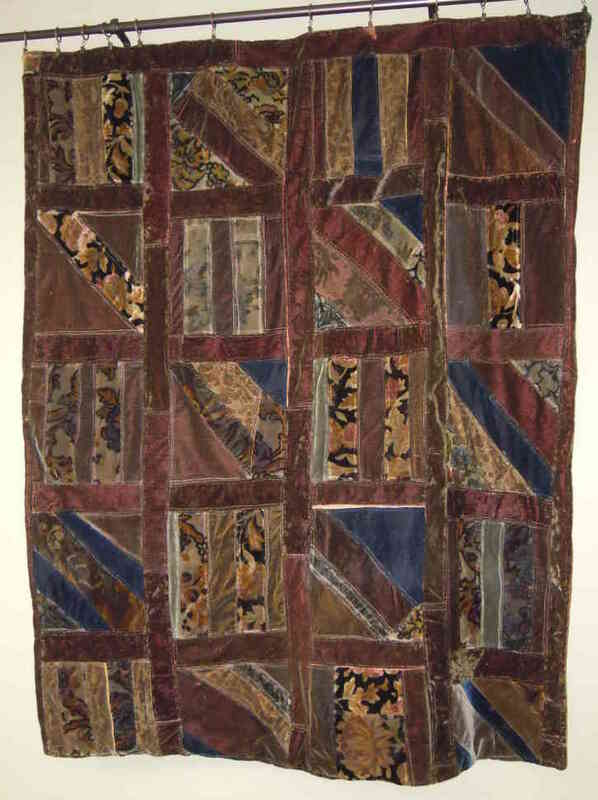 In 1976, Pastor Galen Johns and his wife Edith were given this quilt as a going-away and thank-you gift when they moved to Elkhart, Indiana. There is a photo of the presentation, taken by Ken Jantzi, in Erb Street’s history book Path of a People. Each square tells something about the family who made it over 40 years ago. Some have moved away, some have died and some are still at Erb Street. 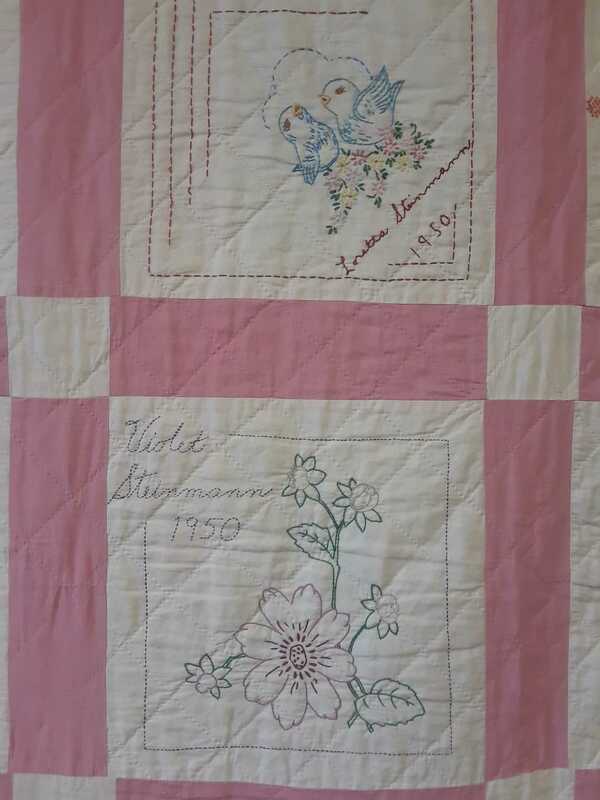 It will always be a part of our history: names, stories, quilt-making. 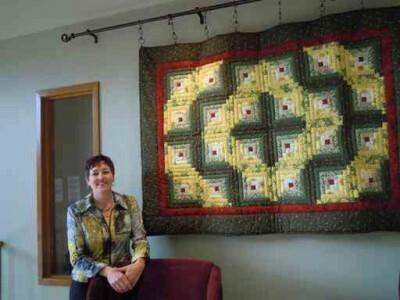 Sometime before 2009 the quilt was purchased by a collector in California who contacted the Erb Street office for information about it. When he was ready to sell it in 2013, we were able to buy it and have it shipped here through the generosity of Ross and Jan Kennel. They paid for it in memory of Ross’ parents’ Edgar and Eileen.